Spot the girl. Extra points if you spot the dog! There’s just something about being outside, I mean really outside, away from crowds and man-made things, that is hard to pin point. It’s best described as something that eases the mind, awakens the soul, and refreshes the body. In other words, it does a lot of good in a lot of ways. Maybe it’s the fresh, crisp air, or the untrampled, somewhat unexplored ground beneath one’s feet. Maybe it’s the views that are unlike anything ever made by man. Maybe it’s the sounds, or lack thereof, or the wildlife that is just as curious about you as you are of it. Maybe it’s the smells – the pine needles, the wild flowers, the sweet grasses, the dry dirt… Maybe it’s the sense of solitude, or self-sufficiency or a necessity for survival – some primitive instinct that begins to emerge when one is far from civilization. Whatever it is, it’s something that I like and something that I genuinely believe is a good something. It’s not always realistic to get outside – really outside – all that often. 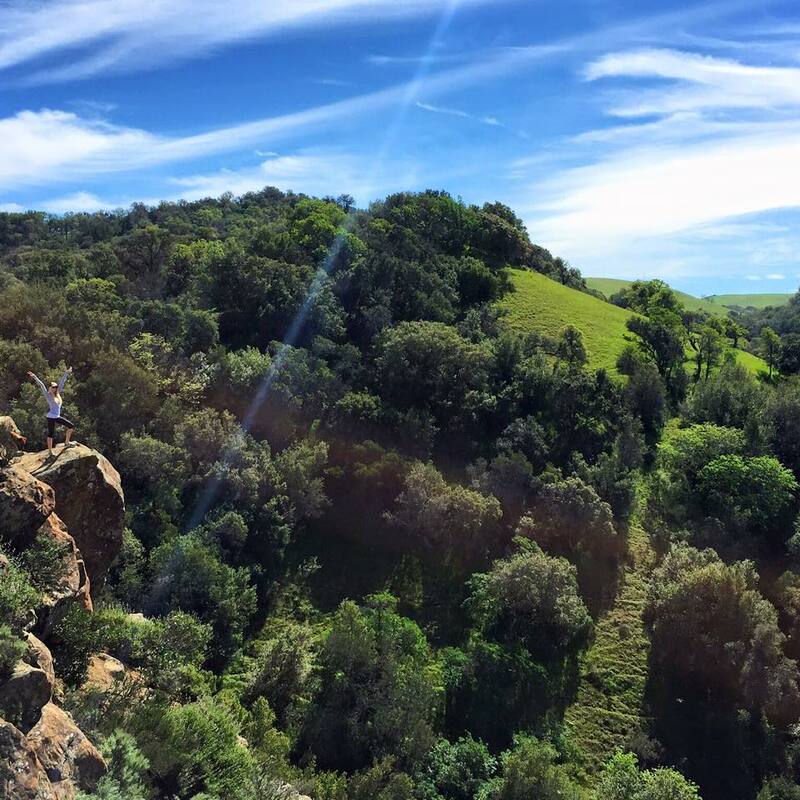 With our fast paced, packed schedules and obligations it can be a challenge to get out into nature even one weekend a month. So I’ve set out to try to pinpoint some ways in which we can try to capture that something and infuse it into our daily lives. A feeble attempt to bring a little of that certain something about the outdoors home to tie us over and stimulate the senses until our next grand adventure when life allows us a chunk of time in which to get lost in nature. 1. Sight: The outdoors are full of beautiful, pure, natural sights and breathtaking views. Try this! Decorate your home with landscape pictures, natural colors, and accents that bring aspects of the outside in. Check out Trekking Photography’s work. 2. Sound: The sound of the wind rustling through the grass and rustling through the trees. The sound of birds chirping and a stream gurgling…the sound of silence. Try this! Leave your windows open and let the fresh air and the breeze in. Find a nice Pandora station that plays nature sounds. 3. 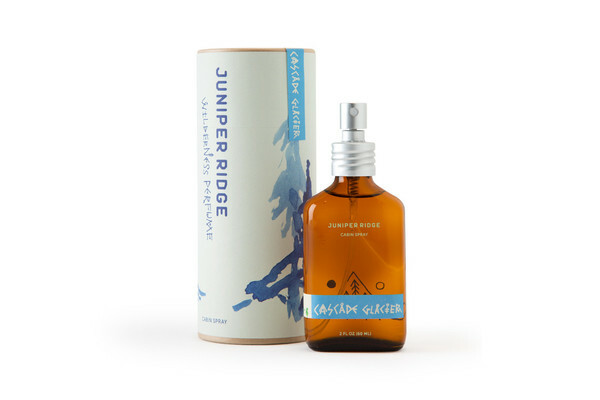 Smell: In the outdoors your nose is met with natural scents of wild foliage and places untouched by man. They are pure and simple and interesting. 4. 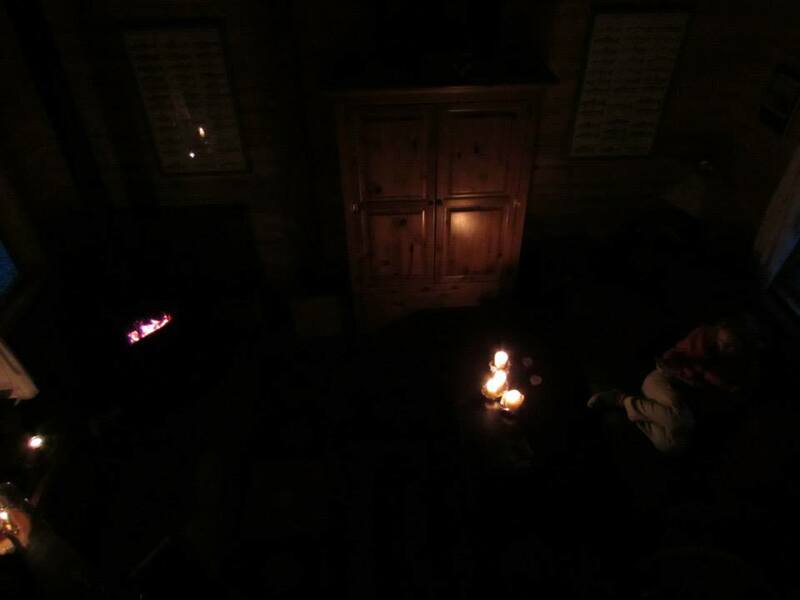 Mind and Soul: Outside, you can unplug and slow things down. There’s no rush and there’s too much to do, see, smell, and hear to even think about updating your Twitter. It’s just you, your thoughts, and your senses. Try this! Unplug for a bit. 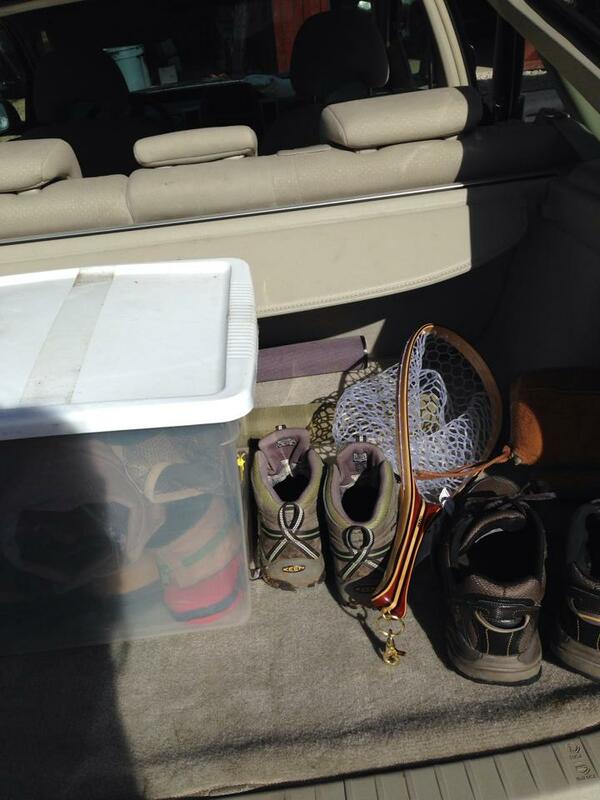 Stow away your electronics for a night or a weekend. Take time to just think and to be aware of your surroundings and engage your senses. Take some of the time that you would normally spend on your phone or computer and instead try meditating. Or do something to care for yourself, such as a nice relaxing bath or a yoga class or reading a book you’ve been meaning to get to. Capture some of that slow-paced, quiet, reflection that being outside gives you. When I’m outside I feel relaxed, happy, curious, and in awe. I think those are good things to feel. So my goal is to try to mimic what I feel when I’m outside in my daily life, even when I’m stuck inside. Let me know what you do to bring that something about the outdoors into YOUR daily life in the comments! Many anglers make the mistake of thinking that once Fall comes around, it’s time to store the fly rod and wait it out until Spring. Not true, my friend. Fall is actually an amazing time to hit the river. The scenery is beautiful, the rivers are lower and easier to wade, fish densities are up due to migratory trout, and there are – as previously referenced – fewer people out there to compete with over fishing room. 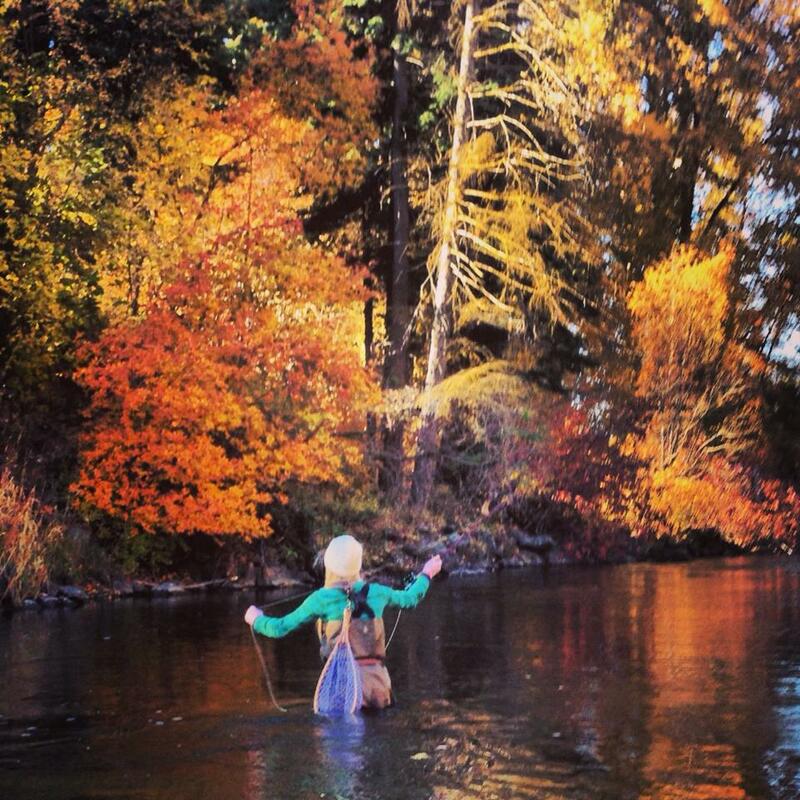 With a good pair of waders and some trusty boots, all that’s left is to bundle up and get out there. Trout Behavior. Several species of trout spawn in the Fall, and consequentially, they become much more territorial and aggressive than they are in the Summer. This can be a good thing for the Fall time angler. A lot of times in the Fall, fly fishermen will opt for streamers, as spawning trout are more likely to chase after and attack these types of flies because they simulate an intruder in the trout’s territory. However, I am here to urge you to give dry flies a chance. 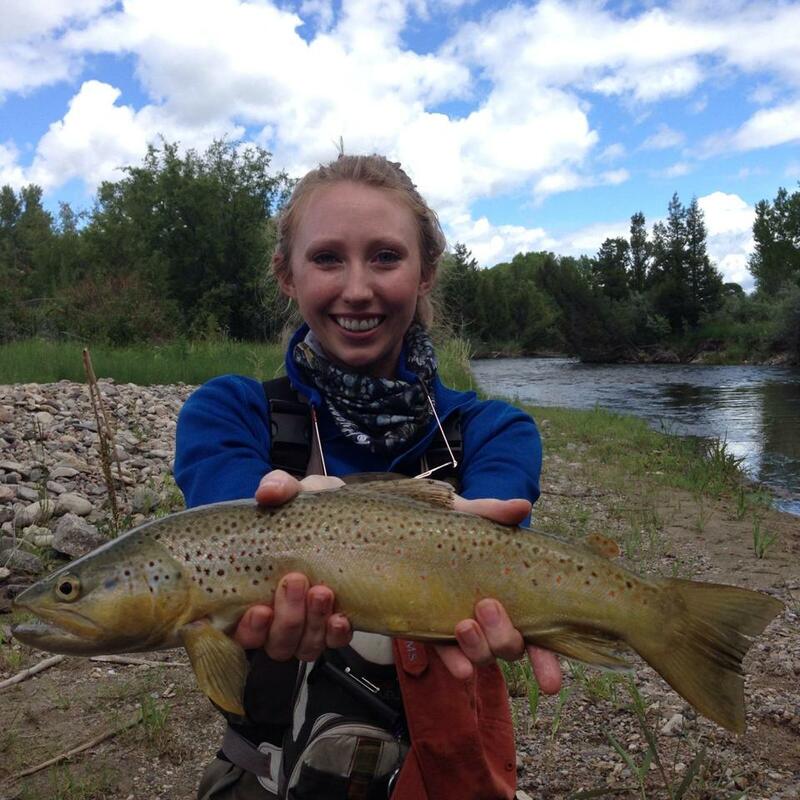 Fishing with dry flies in the fall can be fruitful and rewarding. There are still hatches going on through September and October, and trout will feed readily on dry flies, if you play your cards right. Pay attention to the colors and patterns that you choose. Nymphs and streamers, though an easy way to ensure that you catch a fish, wont offer the thrill and challenge that a dry fly will. If you pay attention to water temperature and sunlight, it is still very possible to experience great fishing on dry flies throughout the Fall. Stealth Is Important. In the Fall, the sun is a lot lower in the sky during the day which means longer shadows. As every angler knows, shadows can spell disaster when trying to pull one over on a trout. A longer shadow, combined with lower water levels means that it is much easier for trout to see you coming. And, if a trout sees you coming, that’s it. Pay attention to where the sun is, and be mindful of your shadows and where they are being cast. Also, be sure that your clothing helps to camouflage you. Wearing neutral, autumn colors is a good idea. In other words, keep the neon in your closet. Be Aware of Water Temperature. Typically, in the summer time, the best times of the day for fishing are the early morning and the evening. During the day, sunlight shines directly onto the water making it easier for fish to see you. Water temperatures get higher which causes the fish to get lazy, so it is generally agreed upon by anglers to be a good time to sit it out. But in the Fall, the opposite tends to be a good technique. Cooler water temperatures actually may result in the fish getting lethargic in the early morning and evening, and becoming more active mid-day when the temperatures rise a bit. So, in case you needed any coaxing or motivation, there you have it! 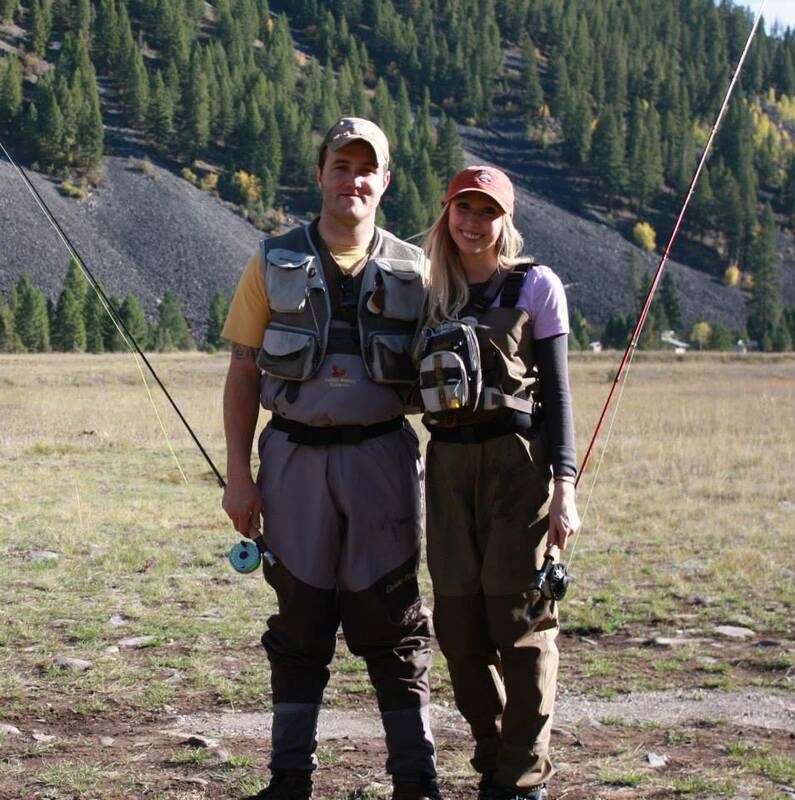 Fall is an excellent time to fly fish and it provides anglers like me who enjoy tactical fishing with even more elements to challenge our abilities. 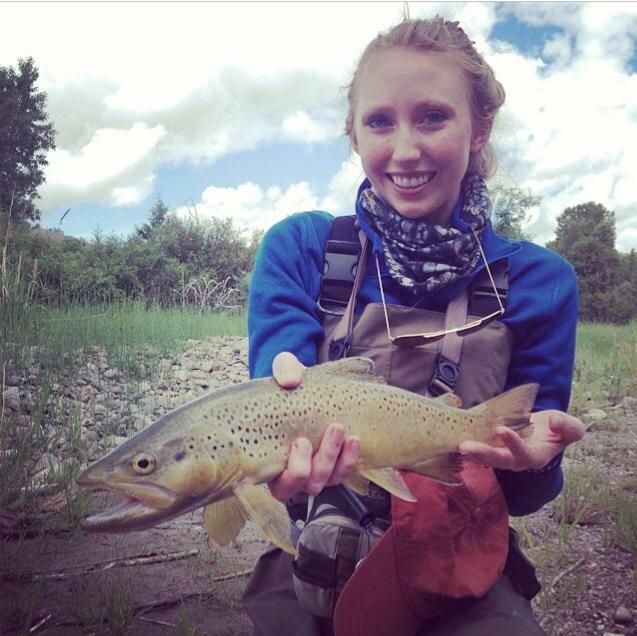 If you’ve been fly fishing for long, and particularly if you have been using primarily dry flies like me, you are surely aware of the fact that some times the bite is on and sometimes it is not. When it is not, you trek up the river for hours, casting and switching out flies to no avail. It is disheartening. It is tempting to simply throw on a nymph or a streamer…anything to improve your odds of catching something. Not catching anything can put you in a bad mood faster than snagging a bush on the opposite side of the shore can. But, when the bite is on – well, there is no better way to describe it than to say that it is magical. The sense of euphoria that engulfs you when you land one giant trout after another on a dry fly is something that you wont get anywhere else. It means not only that the fish are eager and hungry, but that you are giving them exactly what they want. You’re doing it right. I recently just absolutely killed it on the Ruby river in Montana. It was unlike any other day of fishing that I have ever had. I could do no wrong. The moment my fly hit the water’s surface, it was gobbled up by one monster after another. Killing it on a dry fly is not only fun and exhilarating, but it’s also reason to feel pretty darn good about yourself. Because catching a trout on a dry fly is arguably tougher than any other method of fly fishing. 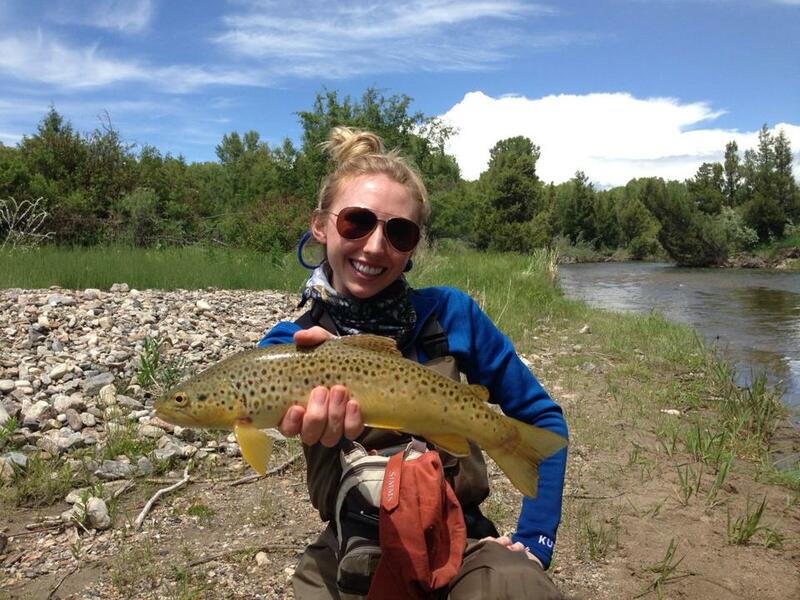 It is fly fishing in its purist form, and when you catch over a dozen in a matter of a few hours on one? Well you can consider yourself the proud owner of some major bragging rights, my friend. Our family’s little slice of heaven. Everyone needs a quiet place to escape to. A place that makes you relax just thinking about it. 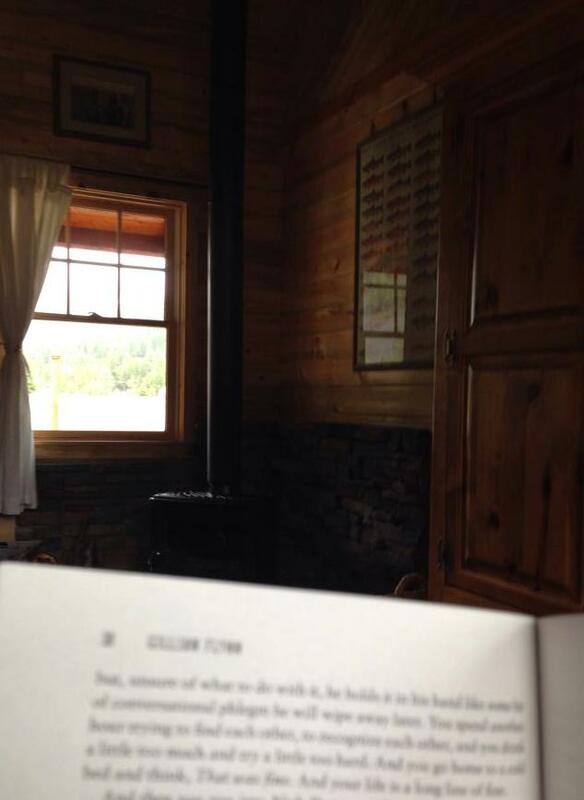 That is what is so great about cabins. They are your own little slice of heaven that you can run off to in order to get away from it all. 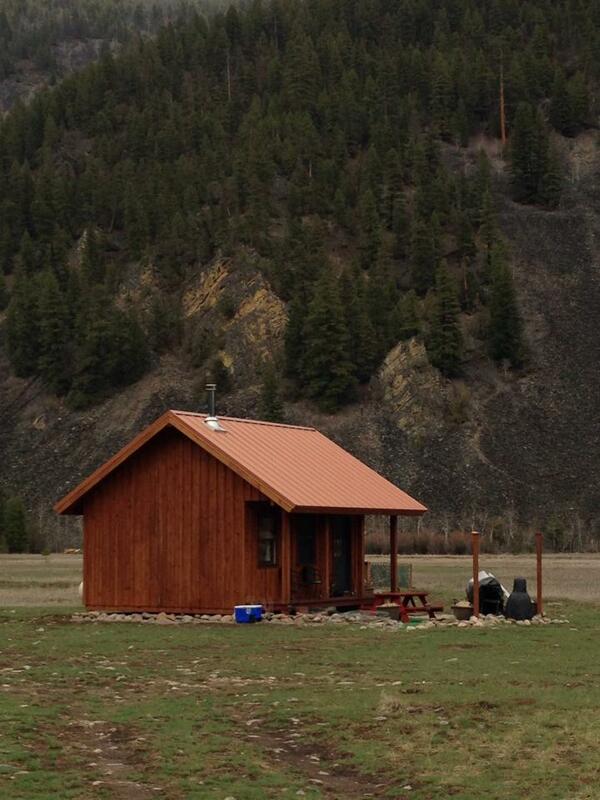 They are a safe haven that you can go to for a peaceful weekend away from the grind; a springboard for adventure. 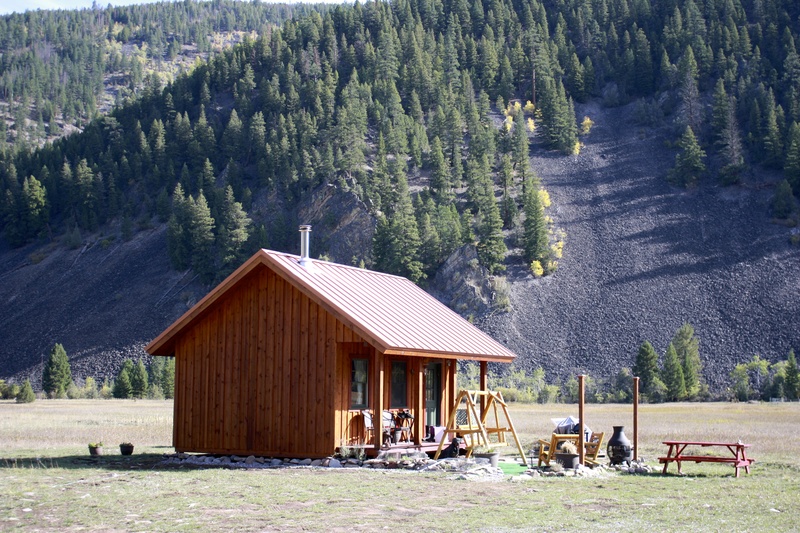 Whether you like to hole up inside with a good book and shut the whole world out, or use it as a base camp for exploration, cabins are what it’s all about. Exciting announcement today at Wild Writes! You may have noticed a few new things around the blog…new colors, new header, new menu options to make finding posts a bit easier, and A BRAND SPANKIN’ NEW LOGO! That’s right, Wild Writes has a logo and I couldn’t be more excited about it. Here it is…the official Wild Writes logo! To celebrate, I’m doing a giveaway! One of my must-have accessories for any cold-weather adventure I go on is my Turtle Fur headband. I wear it everywhere and I love how it gives me just the right amount of warmth, while still leaving the top of my head open for that fresh air. Plus, it keeps my hair out of my face, a MUST when I’m out in the back country. And, I just may throw in a few other goodies with that headband as well! 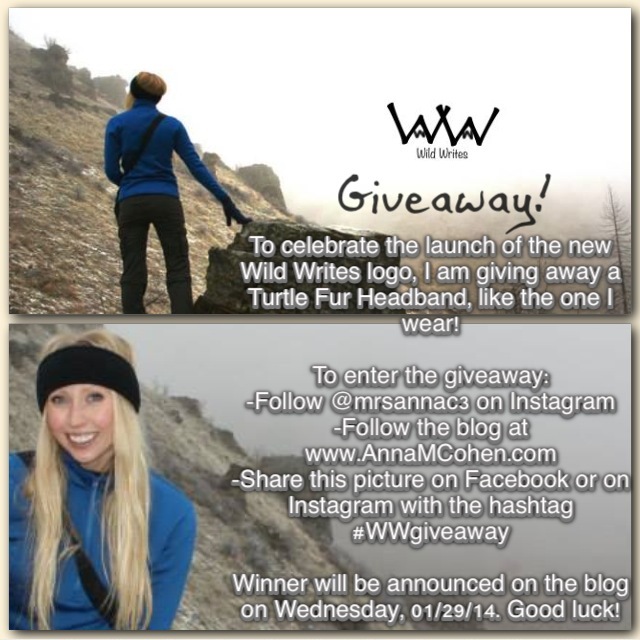 -Share the picture below on Instagram or Facebook with the hashtag #WWGiveaway. And that’s it! The winner will be announced on the blog next Wednesday, January 29th. Good luck! Keep your eye out for some more exciting announcements coming to Wild Writes in the near future! Big things are happening and I can’t wait to share them with you all. I get a wide array of responses when people find out that I am a fly fisherwoman. I have had other women tell me that I am an inspiration. 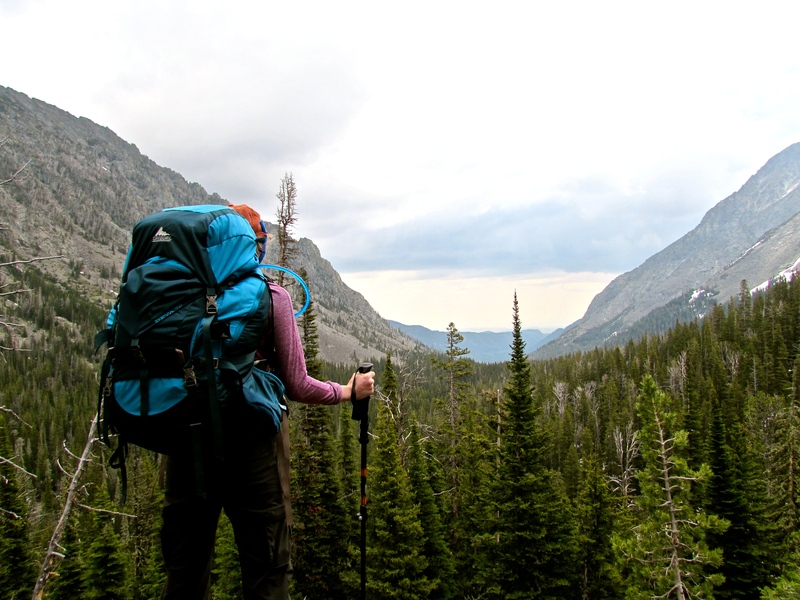 I have been told that I motivate other women to get outside, try new things, and seek out adventure. On the other hand, I have been told that I am weird for getting into fly fishing. 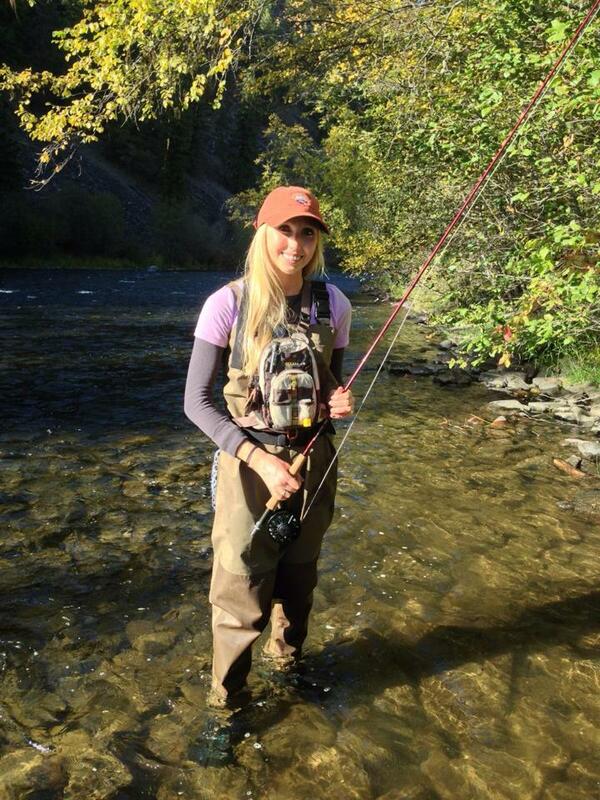 A lot of women don’t get the appeal of the sport, or of the great outdoors at all for that matter. To them, my behavior is deviant; strange even. 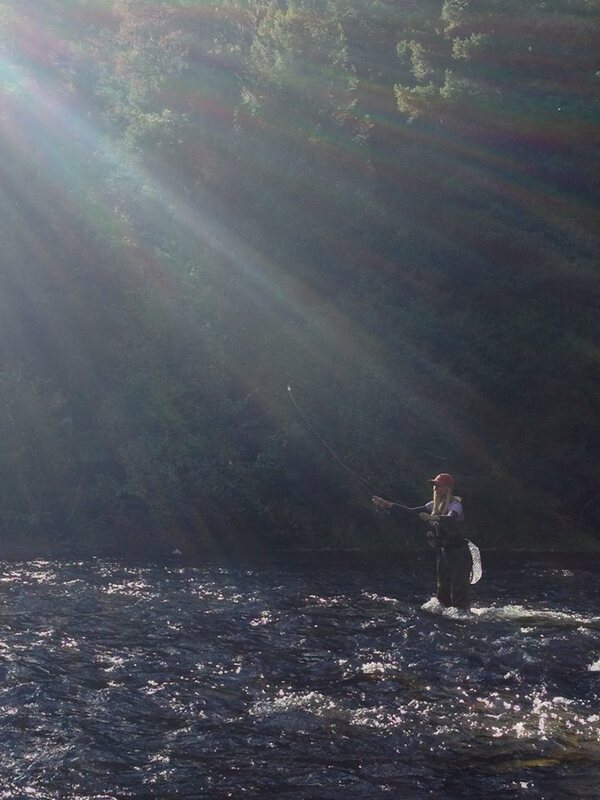 I can’t really explain why fly fishing has captured me the way that it has. At best, I can try to put into words what draws me to it and what thrills me about it. It has something to do with the art and the science of it; of being outdoors in some of the most beautiful places that are inaccessible to those who are not willing to get their feet wet. It is the feel of a rod, swaying gracefully with every forward and backward motion of my forearm, and the elegant curve of line arching overhead. It’s something about how it requires me to read the various movements of the river, and how it forces me to think like a fish, targeting it with a precise and calculated deception. It has to do with the feel of the river flowing against my legs and the cool chill of the water, emanating through my waders. It’s the firm, slick rocks under foot that I must carefully maneuver over in my deliberate trek upstream. It’s the way my muscles ache and my palms burn at the end of a long day on the river. And of course…it is the sudden tightening of the line that comes simultaneously with the shattering eruption of a trout breaking the surface from somewhere deep below and grabbing hold of that fly that I placed ever-so intentionally overhead for him. Fly fishing is a muscle burning, life changing, soul rejuvenating, gut wrenching, exhilarating, freedom finding, beautiful sport. I’m hooked. How I Got Skunked and Why I’m OK With It! Even though I wasn’t catching any fish, I was having the time of my life! 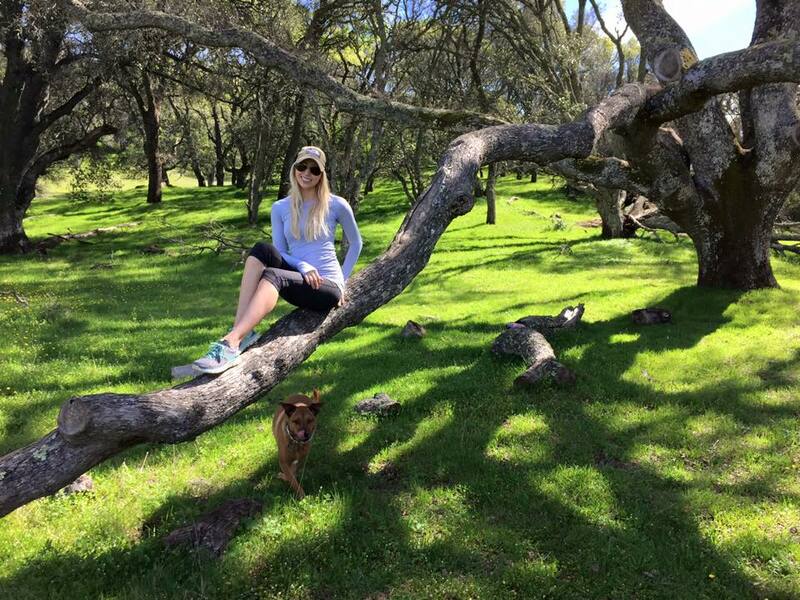 I was in one of the most beautiful places in the world on a blue ribbon trout fishery; my husband – the love of my life- was just up stream of me; aside from the sound of the rushing water in which I stood, submerged up to my waist, the world was silent around me. I was surrounded by mountains and Aspen trees. A soft wind blew gently through their leaves. Gorgeous blue birds flew over head. The sun beat down, its rays just warm enough to keep me a comfortable temperature, despite the frigid waters of the river pouring against my legs, clad in my Frogg Toggs waders [www.froggtoggs.com]. Yes, despite the lack of fishy conquests, I was content. More than content. I was happy. I was enjoying myself. I was breathing in the fresh, crisp, fall, Montana air. I was with my best friend, fishing in an extraordinary river that runs right by our family cabin…I realized how blessed I am. 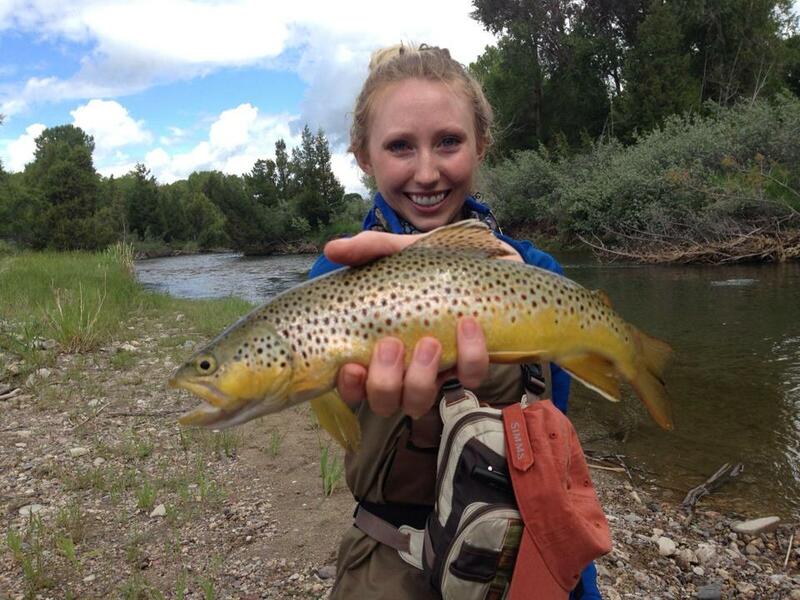 See, that is the best part about fly fishing. It allows you to be present in the moment. It allows you to be with someone you love, and yet, alone in a sweet isolation – just you and the river; just the motion of your rod and the gentle, deliberate ‘C’ of your line, swooping overhead. 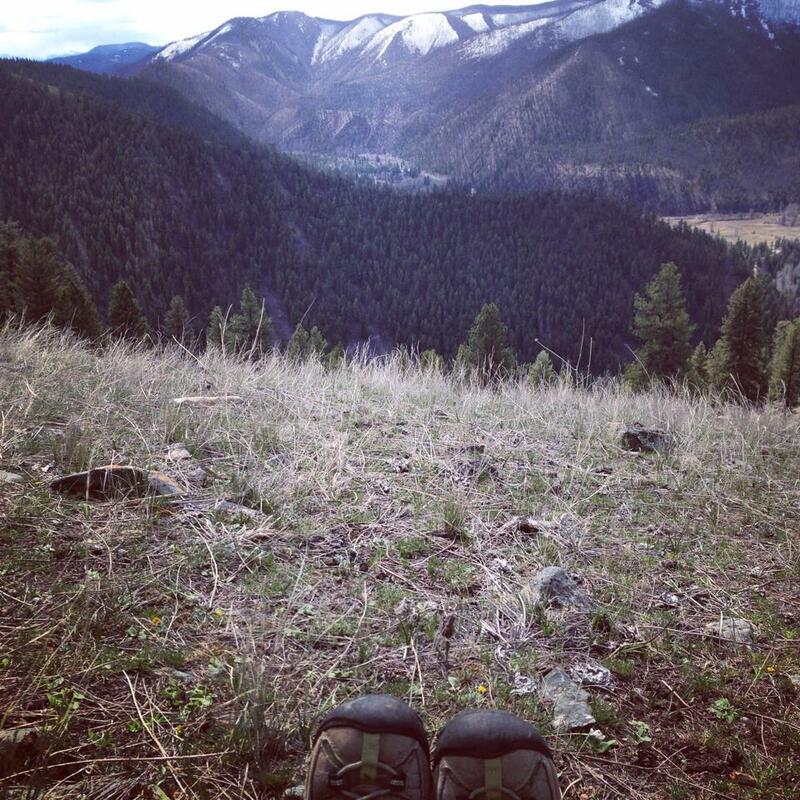 It allows you to feel each rock beneath your booted feet (my boots are from Redington and I love them [www.redington.com]). Fly fishing brings you to some of the most breathtaking places, and lets you see them from a point of view that not many people get to experience – from the middle of a raging river or from a distant shore. We still had the best time together! As Ben and I clambered up the river bank, on the eve of our trip’s end, we smiled at each other. We walked back up the dirt road towards the cabin. Blue birds flitted in the trees and the shadows grew longer as the sun sank lower and lower behind the mountains. Yep, we got skunked. But we still had a damn good time. You win this time, Montana!